One of the common tasks in analyzing data sets is to perform error propagation. 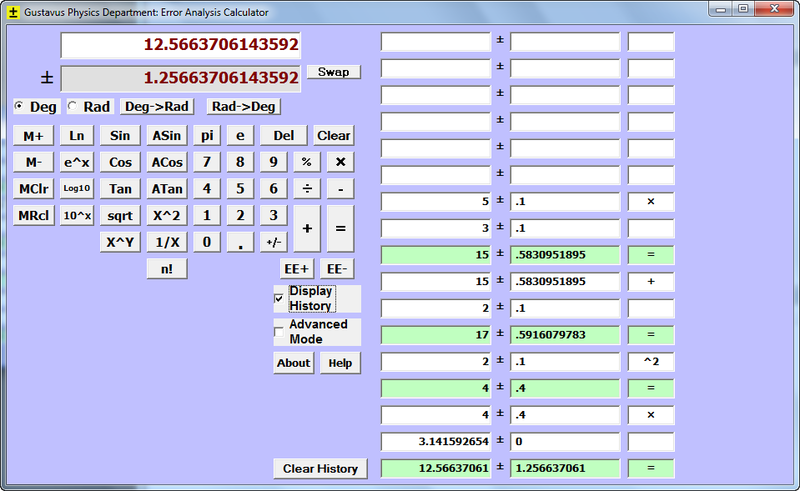 The program ErrorCalc is designed to de-emphasize the tedious work of error analysis. 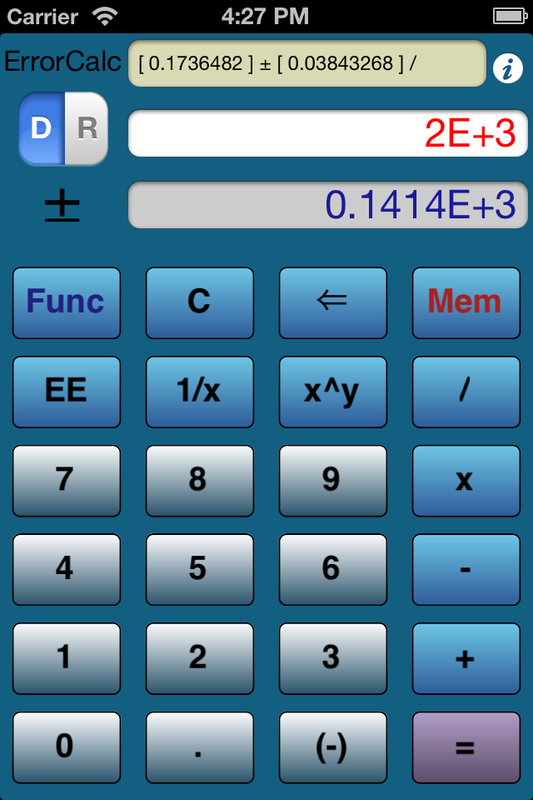 ErrorCalc is a scientific calculator for iPhone, iPad, iPod touch and Windows that is designed for error/uncertainty propagation and analysis of experimental data sets. All values entered into the calculator can include error/uncertainty, which will be propagated during successive calculations. In addition to basic arithmetic functions, trigonometric and exponential/logarithmic functions can be calculated. Both weighted and unweighted means/standard deviations can be calculated for experimental data sets. 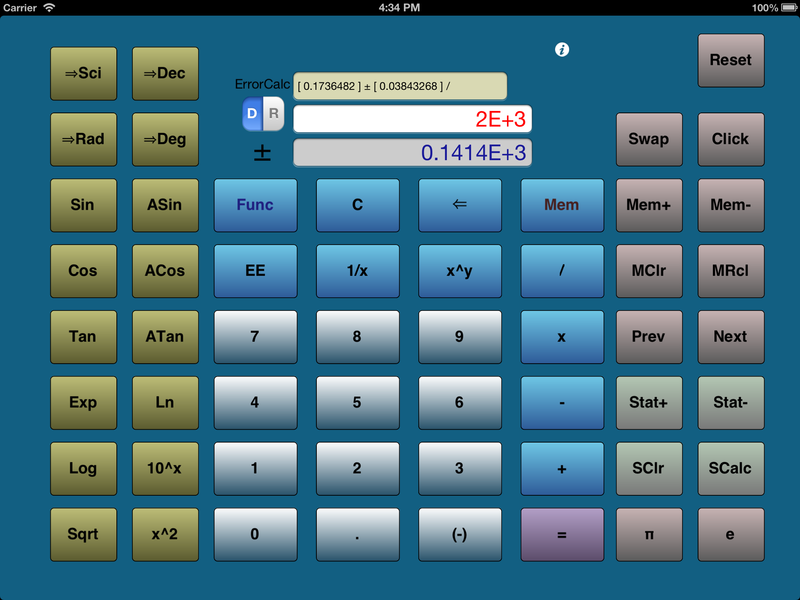 ErrorCalc: An iPhone/iPad scientific calculator app for error propagation! The Windows version of the program, below, is freely available under the GNU General Public License. When this was written, for simplicity the program did not include an operation stack or other operator precedence rules. Operations like multiplication, division, etc. are entered as a value (with uncertainty if appropriate), operator, value (with uncertainty) then equal sign; operations such as trig functions or exponentials operate on the value in the display. This means that you cannot do something like 2 + 5 * 3 = and have it give 17. Instead, you should type 5 × 3 = + 2 =. If each of these values has an uncertainty of 0.1, then you would enter 5 in the value box and 0.1 in the error box, then the × key, then 3 in value and 0.1 in uncertainty followed by =. Then type + and 2 with 0.1 uncertainty, and finally =. Similarly to calculate the area of a circle that has a radius of 2.0±0.1, you can't type πr2 directly. Instead enter 2 into the value box 0.1 into the uncertainty box, then type the X^2 key then × pi =. If you select the Display History checkbox, in the history section on the right, you can click on any value and it will be copied to the display. The screen shot on this web page shows a couple of sample calculations. To enter a value like Avogadros number, type 6.02 then the EE+ key and 23, and the charge on the electron would be 1.602 then the EE- key and 19. Results that have uncertainties greater than 25% will be colored red instead of green. This is a warning to be careful about the validity of the conventional approximation of small errors. For uncertainties larger than about 25%, it is very possible that a different technique (such as Monte Carlo approximation) would be more appropriate for estimating the uncertainties. The Advanced Options checkbox enables calculations such as tails of Gaussian Distributions, and Weighted Averages. This also displays a column showing percent errors for all numbers.